BMW 2 Series Active Tourer pricing revealed | What Car? 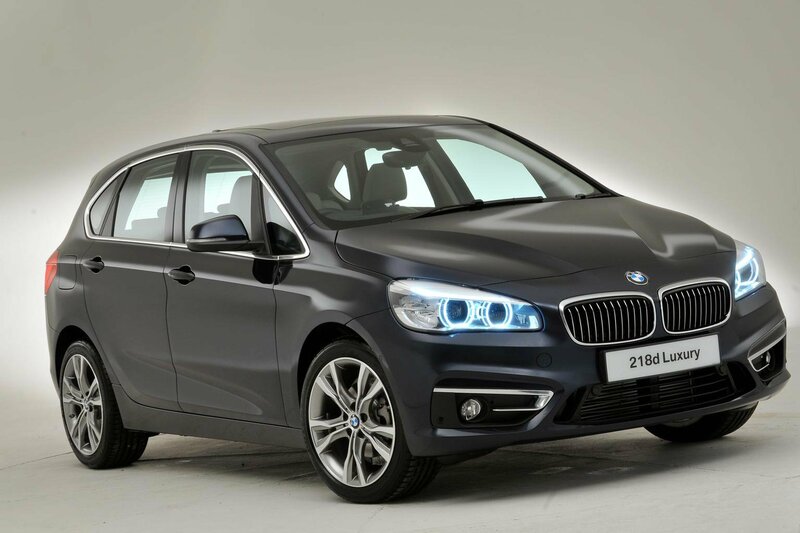 The BMW 2 Series Active Tourer will cost from £22,125 when it goes on sale later this year. The BMW 2 Series Active Tourer is the company's first foray into the world of practical MPVs, and the first front-wheel drive car that it has made, although an all-wheel drive model will also be offered. At 434cm long and 180cm wide it is almost exactly the same size as Volkswagen's Golf SV, although it is 2cm lower, at 156cm high. The BMW is also slightly shorter, wider and lower than the Mercedes B-Class. The 2 Series Active Tourer's rivals are generally good, but not excellent, with the Volkswagen Golf SV and the cheaper Citroen C4 Picasso both scoring four stars, and the Mercedes B-Class managing only three stars. The Citroen scores highly for practicality and affordability, while the Golf is notable for its car-like interior and driving experience. There are only two engines to choose from immediately – a 218i 1.5-litre 134bhp three-cylinder petrol and a 2.0-litre, 148bhp 218d diesel engine. The diesel option emits just 109g/km, whether it is paired with the manual or automatic gearbox. More models, including a sub-100g/km 216d and a 220d diesel, plus 220i and 225i petrols, will be offered later, with order books opening in September and cars being delivered in 2015. Even the SE model gets a generous amount of equipment, including an automatic bootlid, parking sensors, electronically folding rear seats, Bluetooth, auto lights and wipers, DAB digital radio and sliding rear seats. Sport models come with 17-inch alloy wheels, Sport seats and badging and LED interior lighting. Luxury models add leather seats, wooden and chrome interior trim, 17-inch alloy wheels and LED interior lighting. An M Sport model will be available to order from November, and adds 18-inch alloy wheels, leather seats, M Sport styling inside and out, and stiffer M Sport suspension. The 218i SE is priced from £22,125, while the 218d costs from £24,205. The Sport model will add £1250 to the price of an SE, while Luxury costs £2000 more than an SE. The M Sport, when it is offered, will cost £3000 more than the SE trim. Although getting a discount in the first week of a car going on sale might prove tricky, if similar cars in BMW's range are anything to go by, then you won't have to wait long for a saving. The entry-level version of the recently released 2 Series Coupe - the 218d SE - already has Target Price savings of more than £1000. Order books for the 2 Series Active Tourer are open now, and the first cars are set to be delivered on 27 September.